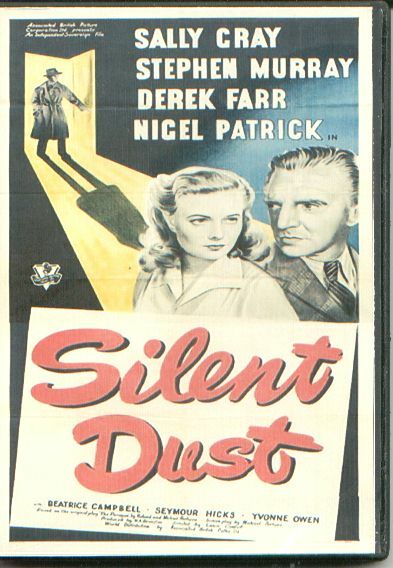 ‚Silent Dust‘ is a post-war British picture starring Sally Gray, Nigel Patrick, Stephen Murray and Derek Farr. 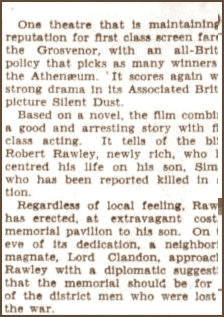 The preview in the Grosvenor Theatrewas on 23rd September 1949 (The Argus 1949, p.10). This release had also been used in aid of the ‚Miss Australia‘ quest. Directed by Lance Comfort, this is a British crime story, whose limited cast and chamber-piece dynamic tightens and heightens the mounting drama. The film was shot in film noir style with dramatic use of light and shadow. 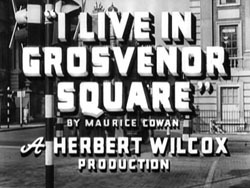 Featuring occasional moments of intentional humour, the film also manages to document some interesting historical class distinctions between the moneyed nouveau-riche Rawley senior and his neighbouring Lordship as it zips its way to a satisfying climax (International Movie Database 2001). A contemporary review in the Australian The Age cited ‚Silent Dust‘ as a ‚first-class screen‘, ’strong drama…(which) combines a good and arresting story with first class acting‘ (see picture on the side). The main character (Rawley) plans to mount a memorial to his son (Simon), who had been killed in the war. His neighbour tries to persuade him to dedicate the memorial to all the men of the local area who had given their lives, and not just his son. Due to the fact that Rawley is blind, Simon secretly returns to try and extort money out of the family. Simon had deserted from the army and was faking his own death. The family tries to shield Rawley from the knowledge of his son’s return, but he discovers the subterfuge, fights with his son, the latter falling to his death from a balcony. Rawley duly changes his mind about the memorial, which he finally dedicates to all the men of the area (NFA Catalogue n.d.).